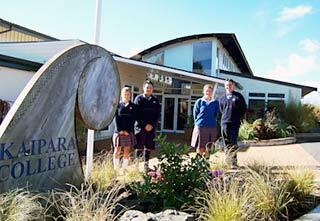 Kaipara College is a small, co-educational school that provides a high quality environment for our students. With a roll of 550 students in Years 9 to 13, we emphasize a balanced programme that provides for academic excellence alongside strong sporting and cultural involvement. We have a proud record of success. The College has highly qualified staff and modern teaching facilities that include science laboratories, an art studio, music suite, drama room, library, computer laboratories & network, technology workshops, swimming pool and gymnasium. We also provide comprehensive care and guidance for students. Our students come from a wide area, from Riverhead, Kumeu and Huapai in the South to Glorit and Puatahi in the North. We also serves the Waitoki and Wainui areas, as well as South Head, Parakai, Muriwai, Waimauku and the country districts in between. Students living in this area may contact the College to inquire about enrolment at any time. The College holds an open day in mid July and the enrolment week is the first week of August. Details are in the local paper and available from the College and local Primary schools. We do enrol students from overseas in to our programmes, offering our international students full access to the New Zealand Secondary curriculum. We have a full range of courses in the Science, Mathematics, Languages, Social Sciences, Technology, Arts and Physical Education faculties. International students are assessed on arrival, and we provide them with special additional English language classes if required. All students can enter for the New Zealand qualifications at Years 11, 12 and 13. This includes the University Entrance qualification in Year 13. Students who wish to enter the University Entrance qualification must have very good English. We will enroll students straight into Year 13 if their English is good. But we recommend that students enter Kaipara College at Year 12 so that they can become more fluent in English and familiar with the New Zealand system. This will give them a strong background to be successful in Year 13. The College arranges home-stays for its international students and monitors them carefully. Home-stays are available in the town, on farms or at beaches. The Tuition Fee for 2009 is $NZ 10,000 or $2500.00 per term. This covers tuition and textbooks. It does not cover stationery, uniform (approx $300.00), examination fees or materials. Homestays cost is approximately $NZ 180 per week and there is a Homestay Administration Fee of $NZ 400 per annum. Application Forms are available from the school on request.